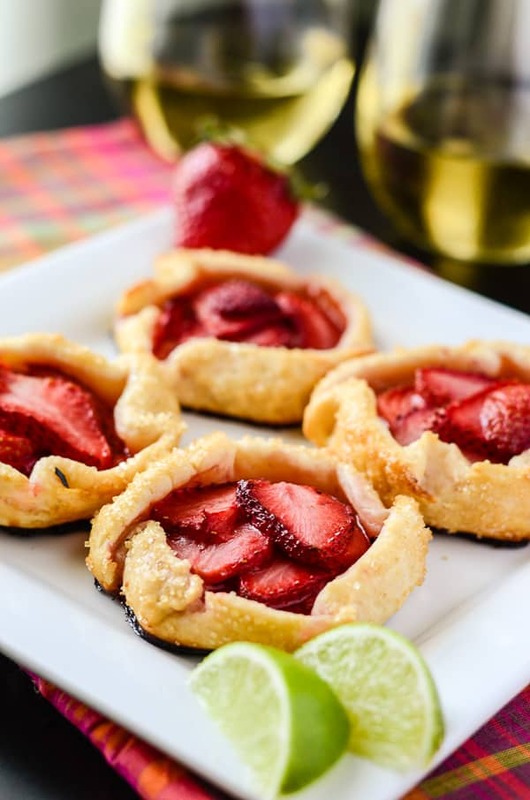 These fun little one person, no-fuss tarts are filled with fresh vanilla lime-spiked strawberries, and are a great dessert even for outdoor meals. I promise you, they only sound fancy. These cute little single-serve tart-pie things are super easy to make…and are ready to devour so much quicker than a regular pie! Make no mistake, I love pie. It’s always worth the effort. But sometimes, you just need near-instant gratification. As for me, sometimes I just need little baby pies that can sit in the palm of my hand. Strawberries. They’re the star of the show. The diva. The Beyoncé, if you will. They keep they’re ruby-hued beauty from start to finish. Of course, they’re given a hand by their more subtle but equally talented backup singers: sugar, vanilla, and lime. Lime is like the Effie White of this dessert. Loud and large in flavor, and yet, still not given the credit she’s due. …and then sprinkled with stardust. OK, so maybe it’s just more sugar. 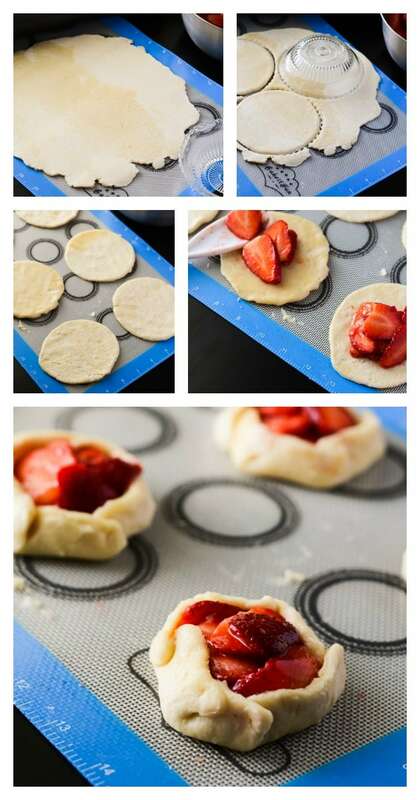 But these lovely little strawberry galettes are perfectly dreamy in their size, flavor, and versatility. That’s what so great about these. Simple to make, even easier to eat. It’s one of the best summer desserts I’ve made so far, and it’s only May! Add cubed [url href=”http://stirlingcreamery.com/consumerproducts.php#reserveunsalted” target=”_blank”]Churn84 butter[/url] and cream cheese, and pulse until the mixture forms large crumbs, scraping down the sides of the processor bowl to make sure all ingredients are incorporated. Add ice water 1 Tablespoon at a time, pulsing in between additions, until the mixture clumps in to a dough ball. Wrap the ball in plastic wrap, flatten it in to a disc shape, and refrigerate 10-15 minutes. 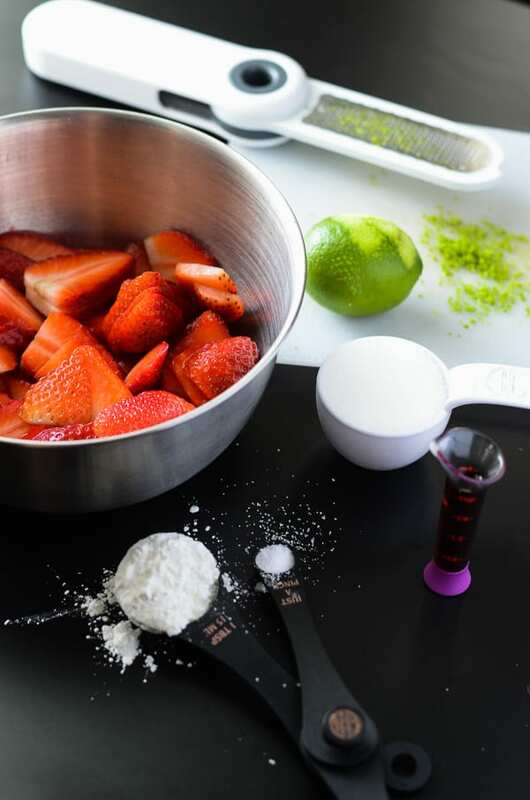 Combine strawberries, sugar, cornstarch, salt, lime zest and juice, and vanilla in a medium bowl, stirring to coat the berries. Set aside. Roll out dough on a lightly floured nonstick surface (baking mat or parchment). Press the mouth of a 3-inch glass or bowl, or large cookie cutter, in to the dough, creating circles. Re-roll remaining dough and repeat, aiming for 6-8 circles. Place dough circles on a baking sheet covered in parchment. Spoon about 1/4 cup of strawberry filling in the middle of each circle. Fold the edges of the galette dough up over the berries, pinching it gently to keep it together. Refrigerate galettes for 30 minutes prior to baking. When ready to bake, combine beaten egg and water in a small bowl and brush each crust, then sprinkle with Turbinado sugar. Bake at 425 degrees F until the crust is crisp and golden, about 15 minutes. How about a Blog Hop?! Now for the fun! Hop over and visit these other blogs and check out their simple summer recipes too! Those are precious! And certainly personal size so I don’t end up eating more than my share at once. Just one every hour, all day long, right? Mmmmmm! I’ve been wanting to make some galettes lately. Your mini version is so cute! And strawberry limeade is the perfect flavor for summer. These would be great for Memorial Day! 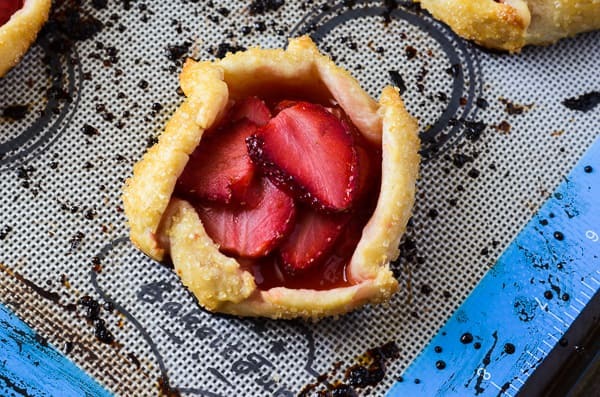 I really like the idea of little individual pies, especially with strawberries. This is a perfect dessert for a big family summer gathering. Your crust sound pretty easy to make too. Pinning for this summer. The crust is SO super easy, and the cream cheese makes it that much better and more tender! It’s by far my favorite! This is a perfect combination! Love it for a quick dessert for a summer gathering! Just gorgeous! This has given me an idea. 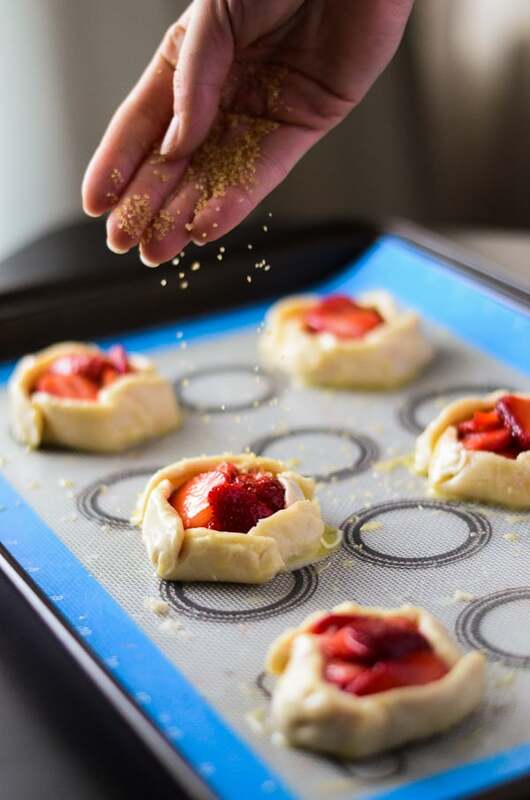 I love making mini pie cookies, but I’ve never tried mini galettes. This just might be the end of year teacher gifts. Yum! Little baby pies that fit in the palm of your hand are just so much better!!! So cute and delicious looking! I usually pair lime with cherry because I love Cherry Limeades but these look delicious. I love making cobblers and crumbles during the summer since the fresh fruit is so accessible! Add a little ice cream and I am in heaven. I *need* one of these little baby pies right now! Wonderful photography! These look great! And I love the combination of strawberry and lime. How do they hold up over time? Best just baked? Good the next day? Do you refrigerate the leftovers, and if so, are they good cold? Personally, I love them fresh out of the oven with some whipped cream, but they were just as tasty a couple days later – they didn’t last longer than that because they’d been devoured! I wrapped them in tinfoil and popped them in the fridge, and reheated them in the toaster oven. Didn’t try them cold, but I bet they’d taste pretty good that way, as well! Those galettes look amazing! I mean, this is Food Network, cookbook quality nom noms! I don’t think I’ve ever seen a sweet treat quite so tasty. I’ll have to make these this weekend. Thanks so much! I don’t think that I have ever had a Galettes before! They look like a delicious dessert! I am so thankful we live by strawberry farms and can get fresh strawberries at the farmers market! So jealous! I love picking fresh strawberries!! I bought some bulbs of my own, now I’m just waiting for them to produce some fruit! I can’t tell you enough how adorable these are! I love the combination of strawberry and lime because it’s so refreshing to me. You also make it look simple enough that I can pull these off with no problems! I can’t wait to try them! This is an awesome recipe! 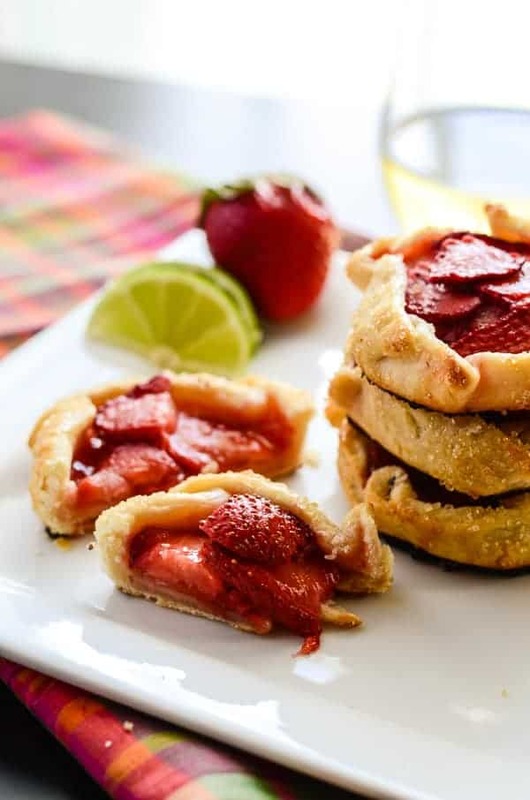 Totally love the mini strawberry limeade galettes! It’s the perfect type of pastry I could serve up whenever I have tea parties. And since strawberries are now in season I can definitely give it a try to make them! Thanks for sharing! Love Strawberry everything! They look so cute and little. Perfect for a summer tea party. Which I am now inspired to plan! So yummy. I am not a baker at all, but the way you made the crust look so easy, I just might try it myself. These look delish and perfect for summer entertaining. Maybe I will have enough time to whip them up for our Memorial Day BBQ. 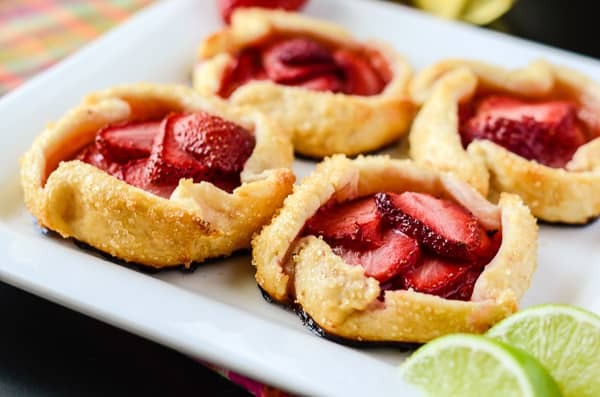 I love pies and these mini strawberry limeade galettes look super delicious and perfect for the tropical season. They are so convenient to eat in a picnic as fingerfood. I won’t mind the calories. 🙂 If I see these in a bakeshop, I’d absolutely take home a pack for my family. My daughter is literally addicted in Strawberries and will eat them alone all day long. This recipe is perfect for two reasons, one it gives me an alternative to offer her, and also because it is easy enough for us to make together. Thank you for sharing. What a yummy looking dessert to bring to events! I can’t wait to try this one at my next girls’ night out with my friends (once a month we try a new baked good). I’m sure they’ll be impressed with this one!